improve information access, efficiency and operations. 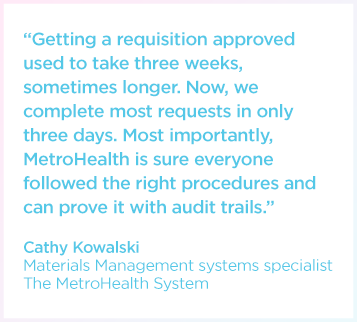 Despite having two enterprise applications in place, The MetroHealth System still had paper-based manual processes slowing down operations in every department. The comprehensive academic healthcare system includes an 861-bed major medical center, a rehabilitation hospital, two long-term care/skilled nursing centers, an outpatient surgery center and a network of community-based healthcare centers. To eliminate paper and optimize processes enterprise-wide, it needed a solution that would integrate with its existing applications. That’s when MetroHealth found OnBase by Hyland. After a request for proposal process involving no fewer than 20 vendors, MetroHealth chose OnBase enterprise content management (ECM) because it met the needs of both administrative and clinical departments. OnBase also seamlessly integrates with more than 500 applications – including MetroHealth’s enterprise resource planning (ERP) solution, Infor Lawson and its electronic medical record (EMR), Epic. OnBase stores and manages information electronically in one, centralized and secure database. Once information enters the solution, OnBase validates the data and automatically associates new information with any related documentation already in the system, eliminating manual indexing. By integrating OnBase with Infor Lawson and Epic, MetroHealth ensures the most up-to-date data is immediately available and easily accessible. OnBase grants multiple users in multiple departments across multiple locations fingertip access to the information they need, when they need it. And it all happens from the familiar screens of the applications they work in every day. With native business process tools, OnBase automates processes, further expediting decision-making. Workflows route invoices and employee change requests for review and ensure compliance with procurement processes as well as point-of-care protocols. OnBase has helped MetroHealth increase security, improve information access and streamline operations from the ER to HR. Improves information access: Whether it’s a physician looking for an Emergency Department chart, an AP clerk who needs an invoice or an HR employee looking up pay histories, only a simple keystroke is necessary to locate the documents they need. Ensures compliance: When the amount of an invoice meets MetroHealth’s purchase threshold, OnBase automatically sends it to the appropriate manager for review. Using business rules set by MetroHealth, OnBase provides a complete audit trail, ensuring the approval process is followed every time. 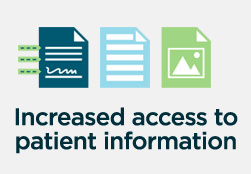 Improves patient care: OnBase provides clinicians access to more complete patient records – all from within Epic. Because OnBase validates and associates patient information with the correct patient record in the EMR, clinicians have a more complete medical history at their fingertips for more informed decisions. Speeds the revenue cycle: At MetroHealth, the revenue cycle starts with registration. 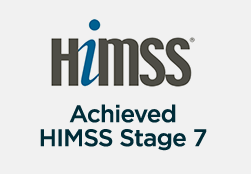 By using OnBase to collect patient documents like consent forms, identification or insurance cards at registration, that information is immediately available throughout MetroHealth, kicking off a workflow in Patient Financial Services. 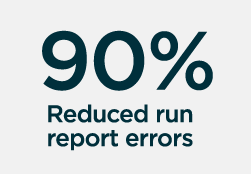 Reduces administrative costs system-wide: By implementing OnBase across its entire enterprise, MetroHealth eliminated paper and all of the delays, bottlenecks and space that comes with it – HR removed the 20 filing cabinets that used to store more than 9,000 personnel files, opening the space up for better use.